Start Every Day With A Mug Of Your Favorite Drink For A Fraction Of The Cost! Makes Smooth, Robust Coffee Every Time WITHOUT Coffee Grounds. 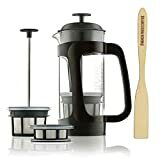 Precision 3-part Filter Design removes all grounds leaving you with a perfect cup of rich coffee. Don’t Settle For Poor Quality! 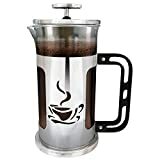 Ultimate Kitchen Coffee Press Has A Durable, Heat Resistant Design! Insulated Borosilicate Glass Carafe keeps your coffee hot, prevents burns, and is dishwasher safe. Brews A Variety Of Gourmet Beverages All At Home! 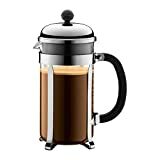 Ultimate Kitchen Coffee Maker can brew 34 oz (1 L or 4 cups) of hot or cold brew coffee, tea, or espresso. Our Luxurious Design Makes Delicious Coffee Every Time! 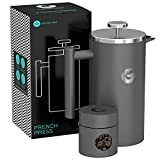 Prevents hot water from touching plastic when brewing coffee so you can treat yourself to genuine European coffee shops coffee at home. We Are Confident In Our Quality Products, So We Are Offering A 5 YEAR REPLACEMENT WARRANTY! Who Else is Offering You That Kind of Protection? If You Are Ready To Try The Best Cup Of Coffee Every Day, Click ADD TO CART Above NOW!